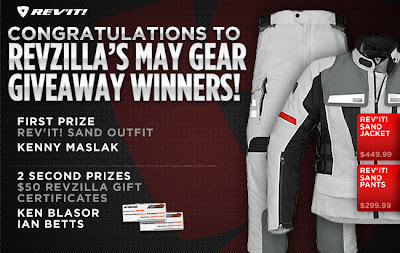 Congratulations to our May 2011 contest winners! Kenny Maslak was our grand prize winner for the month, taking home a brand new REV'IT! Sand Jacket and REV'IT! Sand Pants. Our two second-prize winners were Ken Blasor and Ian Betts, each of whom received $50 RevZilla gift certificates to be put to use however they see fit. Check out our June AGV Helmets Giveaway! If you've entered before, all you need to do is submit an answer to our "Question of the Month" to be re-entered to win! If you haven't entered before, simply create a rider profile to automatically be entered.